At the Cromwell ARC, we offer hydrotherapy for your pet on a state of the art underwater treadmill. The underwater treadmill consists of a treadmill enclosed in a tank, which gradually fills with water to a suitable height for your pet. The underwater treadmill allows your pet to exercise while taking advantage of the therapeutic and buoyant effects of the water. Why is exercising in water so beneficial? Exercising on an underwater treadmill takes advantage of certain properties that water possesses. The buoyancy, hydrostatic pressure and resistance created by water all help your pet on their road to recovery. Buoyancy enables those pets who may be weak or unable to weight-bear due to pain, to exercise in a supported environment. In the underwater treadmill, weight-bearing can be reduced by as much as 60%; a huge benefit if weight-bearing is painful. While in the water, hydrostatic pressure is exerted on your pet. This can help reduce pain and inflammation, and improve circulation and lymphatic drainage. Exercising in water also creates resistance. The means muscles have to work harder, which helps your pet build and strengthen weak or wasted muscles. By carefully selecting an appropriate water level, the physiotherapist can target which muscles are most affected by the water’s resistance. Also, working against this resistance can significantly improve cardiovascular fitness; great for sporting or working dogs that need to improve their fitness. What are the benefits of an underwater treadmill compared with swimming in a pool? There are several advantages to using an underwater treadmill over swimming in a pool when rehabilitating animals. The physiotherapist is able to control many factors including the depth of the water, the speed and incline of the treadmill, and even which legs your pet uses when exercising. This means the treatment they receive can be tailored to target specific areas. Exercising on the underwater treadmill encourages a normal gait pattern, which is often the aim if your pet has been limping or not weight-bearing due to injury, disease or surgery. 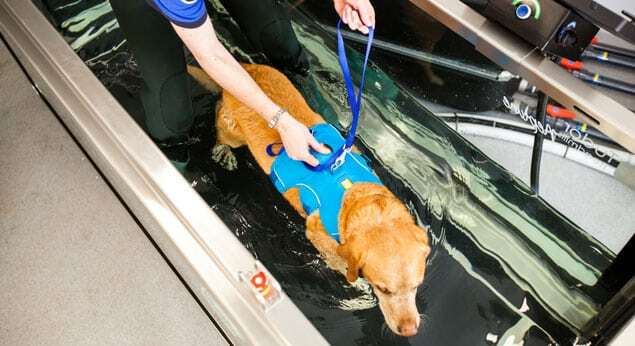 The underwater treadmill can also make hydrotherapy accessible for those pets who are fearful of water; as they walk into a dry tank and the water fills gently from the bottom, most patients tolerate this exceptionally well as their feet are always firmly on a solid surface! What happens during an underwater treadmill session? When your pet arrives for an underwater treadmill session, the animal physiotherapist will begin by performing a health check. This will include taking your pet’s heart and breathing rate and a general check over for any wounds or changes in muscle condition. They will also check with you that your pet has been well since their last session. Following the health check, your pet’s own collar or harness will be removed and replaced with a well-fitting harness and lead. Your pet will then be showered to remove any dirt or loose hair. My pet doesn’t like swimming; can they still go on the underwater treadmill? The underwater treadmill is very different from swimming in a river, lake or swimming pool as the pet always has their feet on a solid surface. Also, the water fills gradually from the bottom, so the pet doesn’t have to actually step into the water; it just fills gently around them. Added to that, the sides of the tank are all clear, so your pet will be able to see you at all times – very reassuring for nervous animals. The amount of time your pet spends exercising on the underwater treadmill will be dependent on a number of factors, including their condition, age, fitness and general health. Initially they may only do very short bursts of exercise with rest periods in between. As they improve, the time on the treadmill will be gradually increased, but your pet will never do more than five minutes without a rest period. Each session will allow enough time for your pet to acclimatise to the environment, receive a health check, be showered before and after, and towel-dried. Can I stay with my pet while they are on the underwater treadmill? Here at the Cromwell ARC, we believe the owner is an integral part of a pet’s rehabilitation team. We very much encourage you to stay with your pet for their underwater treadmill session, as you can provide reassurance and encouragement to your pet. Can my pet eat before they go on the underwater treadmill? We ask that you do not feed your pet for two hours prior to a session on the underwater treadmill. While we do have absorbent micro-fibre towels that will remove a large amount of the water from your pet’s coat, we ask that you bring a large towel to finish off the drying process (plus an extra one for the car!). How will my pet be kept safe while in the water? Before entering the treadmill, your pet will undergo a health check by one of our animal physiotherapists to make sure it is safe to proceed. Your pet will then be fitted with a harness to ensure they can be restrained or lifted if necessary. The animal physiotherapist will enter the treadmill with your pet and will remain there for the duration of the session. Regular checks will be made on your pet, such as heart rate and breathing rate, to ensure they are coping well with exercising on the underwater treadmill. Also, water quality is closely monitored to ensure your pet is exercising in clean, safe water. Is the water treated like in a swimming pool and is this safe for my pet? The water used to fill the underwater treadmill is treated with chlorine, much like the water in a swimming pool. Water is tested at least three times a day to ensure safe but not excessive levels of chlorine are maintained. You pet will be showered after they have been in the water to remove any chlorine from their coat. Will my pet be cold after their underwater treadmill session? Pets will be towel dried after their session and the centre is heated, but we do recommend bringing a coat for them to wear on their journey home. My pet isn’t injured; can they use the underwater treadmill just for fitness? Yes. We offer fitness sessions, which are ideal for keeping sporting and working dogs in peak fitness, improving or maintaining condition of show dogs or just keeping your pet fit. Exercising on the underwater treadmill can also be an integral part of a weight loss programme for your pet. Is the underwater treadmill just for dogs or can other animals use it too? Dogs, cats and even rabbits can be successfully treated on an underwater treadmill.